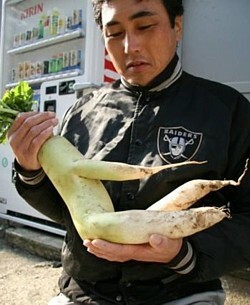 A daikon radish with a distinctly human shape is the talk of the town in Sasamicho, Wakayama prefecture. Keiko Tanaka, 74, harvested the rather large daikon radish from her family farm. The daikon�s resemblance to a cross-legged woman surprised her as she unearthed it, prompting her to name it �Monroe-chan." She has since been showing it off around town. �It has such a beautiful body line. I�m sure it will taste better than your average daikon,� says Tanaka. How much steamy pleasure this daikon adds to the process of cooking oden remains to be seen. �It has such a beautiful body line." The guy is getting off on a radish! I am writing a book for my grandchildren about vegetables, and I would like to use your photo of Marilyn the daikon. Is it oK? I'm not publishing the book for profit.